Figuring out how to do this kind of thing has been difficult and uncomfortable. First of all, I don't care for the implication that intuitiveness can be measured objectively; I think that intuitive equals familiar. Second, I've spent the last year being trained to express proofs in ways that computers can understand, which is to say, not very much like this. Third, dammit, I like algebra. "A dinner party without whiteboards, I mean," I clarified to Chris chrisamaphone. "Sounds like a pretty dull dinner party," she said. One idea that a young reader (I'm thinking about my 5th grade brother) might be unfamiliar with is that knowing two of the angles of a triangle tells you the third angle. Maybe showing a transformation that flips and then shrinks one of the roofs into another would explain it? I don't know if I have time to make another figure, but I could definitely throw a "Since knowing the two angles tells you the third angle..." in there. Thanks for the feedback! A pretty dull dinner party indeed! I hadn't seen this proof before; I rather like it, although I think I share your skepticism about "intuitive" geometry proofs. As a reasonably mature mathematician, I still like knowing a lot of them as a form of memory compression. I know to really prove it, I'd do something else. The reason I like this proof is it makes some sense if you don't even draw the canonical squares-on-sides-of-triangles, and just focus on the right triangle and how it can be subdivided into two similar triangles by dropping that perpendicular to the hypotenuse. For you have to learn at some point that fundamental fact about n-dimensionalness that when you scale up an n-dimensional thingy by a factor of k, its volume goes up as k^n. And so just to see that you can find widgets "proportional to" the two legs of the right triangle that in (two-dimensional) volume add up to the hypotenuse one means that you are really talking about squared things adding up to a third squared thing. For this proof, you needn't know that the k^n thing is true in general -- you just need to know that the area of a square is defined as the length of its side, squared. But there's no reason why they have to be squares -- they could be any old similar polygons that have a side of the triangle as one of their sides. Actually, I don't think they even have to be polygons, but then you have to worry about defining similarity for arbitrary shapes, I guess. I don't know if it really makes sense to say that this or that proof of a particular fact is the real reason that the fact is true. However, I do know that if I put e^(-x^2) * e^(-y^2) * e^(-z^2) = e^(-(x^2 + y^2 + z^2)) on my homework, Doug would fire me. Or whatever it is that they do to grad students. I mean, I use phrases like "the real reason" very fuzzily and intuitively without any claim that they really mean anything. But I think there is a deep connection between the squarings that show up in the e^-x^2 of the central limit theorem and the squarings that show up in the Euclidean norm (of any dimension, of course, not just 2!). 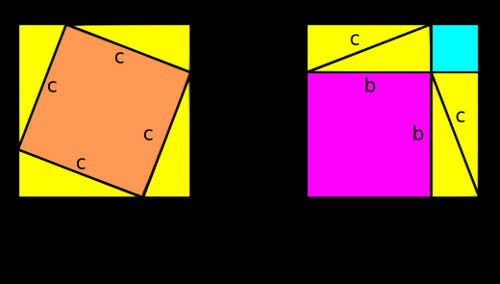 It's not the reason that the Pythagorean Theorem is true in Euclidean space; proofs such as the one you gave are explanations of that fact. But I suspect it has something to with why our universe is locally Euclidean in the first place. That seems convincing, though I don't know how much of that is based on knowing things already. I mean, is the idea of "similar triangles" and proportional sizes "intuitive"? To whom? You made me do my own! Nice! My favorite proof is the one I use in Calc class as a "fun fact". But I actually like yours quite a bit as well - I have seen that drawing of the triangle with the squares on its sides, but nobody ever was able (until now) to explain to me exactly how and why that managed to prove the theorem. Thank you! Re: You made me do my own! Have you seen the ones that use tiling?